Step by Step is aimed at users that are new to Visio or users that have a basic to intermediate understanding of Visio. There are a lot of changes in Visio 2013, so even long-time users of Visio will get valuable information out of this book. I have Scott’s book in my posession, well it’s in Kindle on the iPad anyway. I will post comments, impressions and opinions as I get further into it. Readers of my last book, Using Microsoft Visio 2010 might be gushingly ecstatic and overjoyed to the point of tears that there is an update to this book too! Well, sort of. 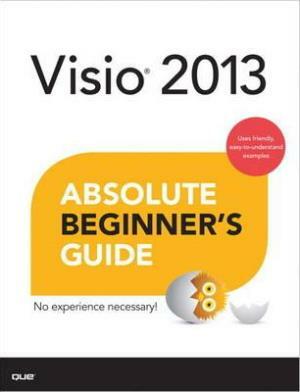 Visio 2013 Absolute Beginner’s Guide, by Alan Wright and Chris Roth is theoretically an update to my last book. Except that the focus is different, and I didn’t write it! As the name suggests, it is aimed at absolute beginners, but as I mentioned with Scott’s “Step by Step” book, Visio 2013 has a lot of new changes, so even intermediate users of Visio will likely find it useful. 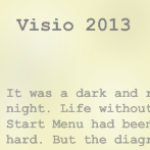 While the Visio 2010 book was intended for end-users, there was no “absolute beginner” constraint placed on it (as far as I knew). Also, the new offering does not come with any online video- nor audio files, as far as I know. In some ways, this is probably a good thing, since so many customers had problems logging into the site to access the bonus content. While my name is on the book, I had nothing to do with the project, other than the fact that my 2010 book was used as a basis for this book. Software books evolve, just as the software itself does. After a lengthy battle with the German Customs Office, my copies of “Absolute Beginner’s” has finally arrived at my doorstep. I looking forward to sharing my observations with you, either on this page, or on a new posting. Phew! That’s quite a long name for a book! Other fellow-Microsoft-MVP David Parker (of bVisual.net) has just released an update to his advanced book on rules and validation: Microsoft Visio 2010 Business Process Diagramming and Validation. 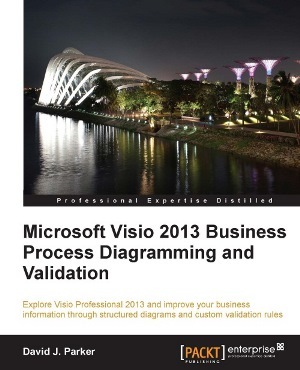 The new book, is (surprisingly) titled: Microsoft Visio 2013 Business Process Diagramming and Validation. Did you spot the difference? Build flowcharts, business process diagrams and cross-functional flowcharts using built-in Visio 2013 functionality. Understand advanced, under-the-hood concepts involving Visio pages, documents, stencils, masters and SmartShape behavior, as defined in the ShapeSheet, as well as Visio object model and programming interface. Create custom rules for validating Visio diagrams to ensure that they are correctly formed. The book includes a download to a special Visio add-in called Rules Tools that makes the creation and inspection of custom validation rules much easier. David has created a page for his new book, including a slice-of-life about a recent trip to India to visit the publisher’s offices. 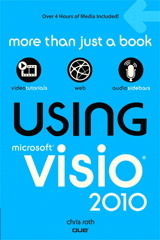 See: New Visio Book Out Now! Chris Roth / Visio Guy / Visio 2013? In addition to having my name attributed to a book I didn’t write, I am (really) working on a QUE Live Lessons video series for Visio 2013, which I hope will be released in the coming months. While writing Using Microsoft Visio 2010, I found the lengthy bullet-lists of steps needed to guide users through tasks in Visio to be awkward, unwieldy, and dull to write (and read, too!) Visio is a visual product, and I believe that watching short videos on essential and intermediate tasks will be more valuable and interesting for users, and more enjoyable to produce for the author. Don’t get me wrong, written words still have a place in the Visio-sphere, especially when describing power-user details in-depth–as this website and others often do, or for fueling discussions like the comment sections and forum permit. Text is also much more searchable over the internet (although the geniuses involved in search will likely change that soon). While your intentions are good, and I get it, I think you’re wrong on this one–assuming that by “video” you mean a screen recording. What’s really needed is a step-by-step sequence–something more like flipping through the slides of a presentation–with call-outs. Video is a horrible format–first, it’s terrible for finding the part that you missed the first time around. Second, the compression used in most video formats makes it very hard to see exactly what’s going on. The trouble is–it can take a long time to make this kind of an illustration. I have some examples that I cooked up for a never-produced all-electronic version of “Real World InDesign”–I’ll have to find them. Done right, I think this approach is the best mix of animation and static illustration–which I continue to believe is better for tutorials than video of any sort. Great comment, as usual, thanks Ole! 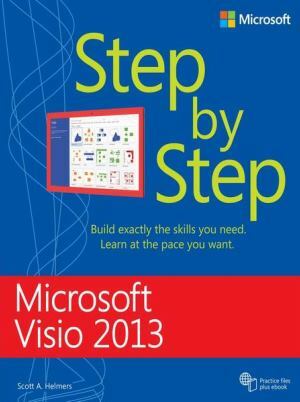 The Microsoft Visio 2010 Step by Step book is also for beginners imo. Its around 650 pages finished it in 2 days. Was able to skip like 95% really would have liked to see some more advanced features discussed . Ah well. Would really like to see some more advanced video’s and books. Where they draw a real corporate network and an real networking racks. This one is a little more complex but still really really far from real world and the designs are far from real like networks. Then its really easy anyone can draw a good looking network if you only draw like 8 devices. But gets 100x harder when you have to draw 125 networking devices. How to make it still look good and keep the overview. For me, I would love to see a basic, intermediate and advance series (books or video Ole definition) on just networking diagrams. Layers, automation, external data inputs, real time updates from API calls. I been in networking for over 15+ years and have always believed I was good with Visio but I realize now I’m not.